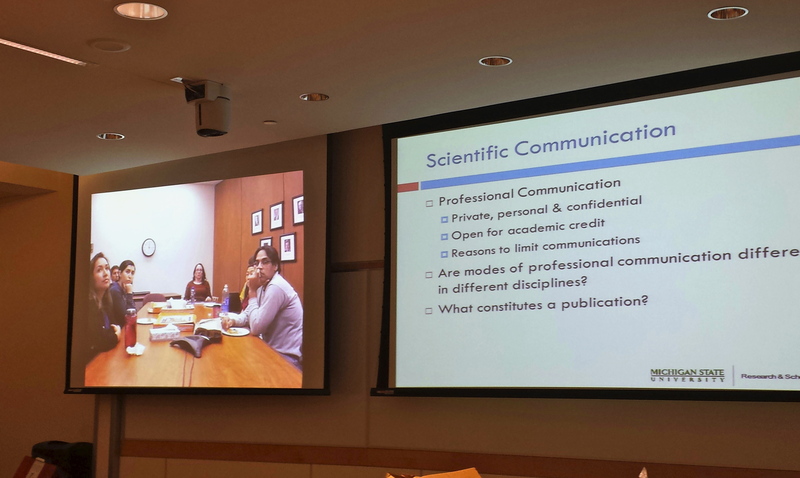 On February 5, 2014, Dr. Stephanie Watts, professor of Pharmacology and Toxicology at Michigan State University’s College of Osteopathic Medicine, joined the MSRJ elective students to discuss the importance of scientific communication and responsible conduct in research, while also providing helpful advice regarding the publication of MSRJ. Due to the many modes of communication that are available to students today, Dr. Watts spoke about the importance of choosing the correct avenue for scientific communication to take place. “You all live in a different world of communication than most and there are a variety of reasons to communicate in different ways depending on what you are trying to communicate.” Dr. Watts also discussed how social networking sites, open-access journals, and peer-reviewed journals all have the ability to influence the effectiveness with which research gets communicated throughout the scientific community. This was of particular interest to the students due to the fact that the MSRJ prides itself on being an open-access journal that is readily available to students and physicians. Speaking about the process of publication, Dr. Watts not only provided helpful resources for the students to use as peer-reviewers and fellow researchers, but she also shared helpful advice to the MSRJ elective students about how to successfully maintain a journal that utilizes an objective peer-review process. “Keeping the authors informed about [the status of]their article is incredibly helpful and it helps prevent them from feeling abandoned during the process.” This piece of advice is critical in the management of a journal because it gives the authors the credit and recognition that they deserve for their research. The encouragement and the resources from Dr. Watts were well received by the MSRJ elective students as they near the end of the elective course and become members of the MSRJ staff as reviewers and editors. Kaitlyn M. Vitale is a second year medical student at Michigan State University’s College of Human Medicine. She completed a B.S. in Biological Sciences with a minor in Anthropology from the University of Notre Dame in 2012. She is undecided about her future career goals but is interested in pursuing an Internal Medicine or Pediatrics sub-specialty.